I went on a trip to the Denver area for a few days recently. One of my first dining experiences in Denver was at a restaurant called Biker Jim's Gourmet Dogs. Before I visited Denver, this was one of the restaurants that I got a recommendation to try. Biker Jim's doesn't serve your standard hot dog. The dogs that they serve contain exotic meats. They had reindeer dogs. There were jack-a-lope dogs. The hot dog that I tried was the Rattlesnake and Pheasant. The sausage was filled with two meats that I had never tried before. Pheasant, a wild game bird, combined with venomous reptiles. How could I resist trying something like that!? I had my dog topped with The Desert. This was harissa roasted cactus, Malaysian curry jam scallions, cilantro, with fried and grilled onions. For the sausage itself, the pheasant and rattlesnake combination had a very poultry-like flavor and consistency. If I didn't know what I had ordered, I'd assume this was a standard chicken or turkey sausage. It makes sense with the pheasant, but rattlesnake was an unknown. I guess rattlesnake tastes like chicken? The toppings really made the hot dog. I think if it was only the sausage, I'd be disappointed with Biker Jim's (besides the thrill of eating venomous snake). The cactus was delicious, and along side the other toppings, provided a delicious flavor combination. I'm going to start a string of some blog posts about food from my recent travels outside of the Central Florida area. An airport is a good place to start talking about traveling. I flew out of the Fort Lauderdale-Hollywood International Airport on Spirit. My plane ended up being delayed about three hours, so I had time to kill there. Eating is a good way to pass the time. There was an interesting choice of foods in Spirit's terminal. Rather than the typical airport chains, this terminal had a Kafe Kalik serving Bahamian food and a second restaurant called Casavana Cuban Cuisine. Each restaurant was split into a fast food and sit down section. 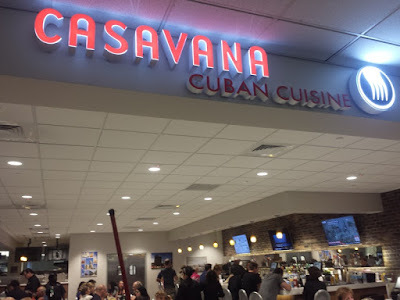 Being that the prices were similar in both, I ate in the sit down section of Casavana. 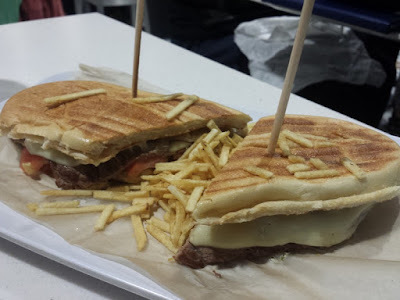 I had the Pan con Bistec. This was a sandwich consisting of steak, onions, tomatoes, fried potato sticks, and cheese. The sandwich was disappointing. Eating the steak was like chewing on leather. Even with the cheese and vegetables, the sandwich was very dry and needed some sort of sauce (none present on the table). Somehow a whole lot of the potatoes ended up outside the sandwich rather than between the bread. The sandwich may have been disappointing, but I enjoyed my experience eating here more than I would have if the airport terminal only offered the typical McDonalds/Burger King/Wendy's options, plus eating here consumed time before my flight left. 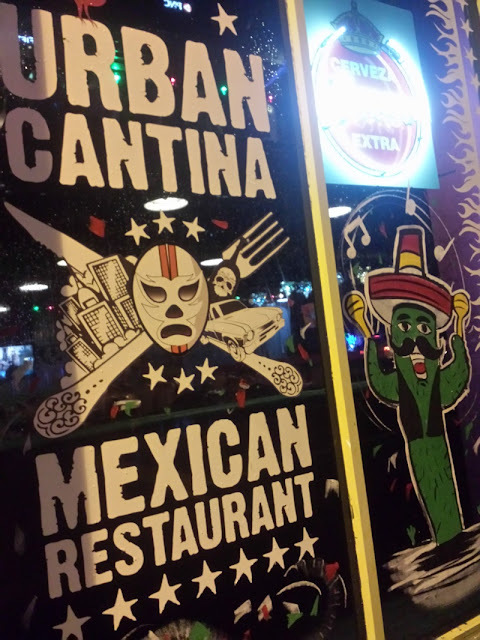 On a recent rainy evening, I stopped for dinner in Downtown Tampa at a Mexican restaurant called Urban Cantina. My initial destination was going to be a nearby Taco Bus location to give them a second try. After walking by and seeing that restaurant deserted with all the employees outside smoking, we decided to give Urban Cantina a try instead. 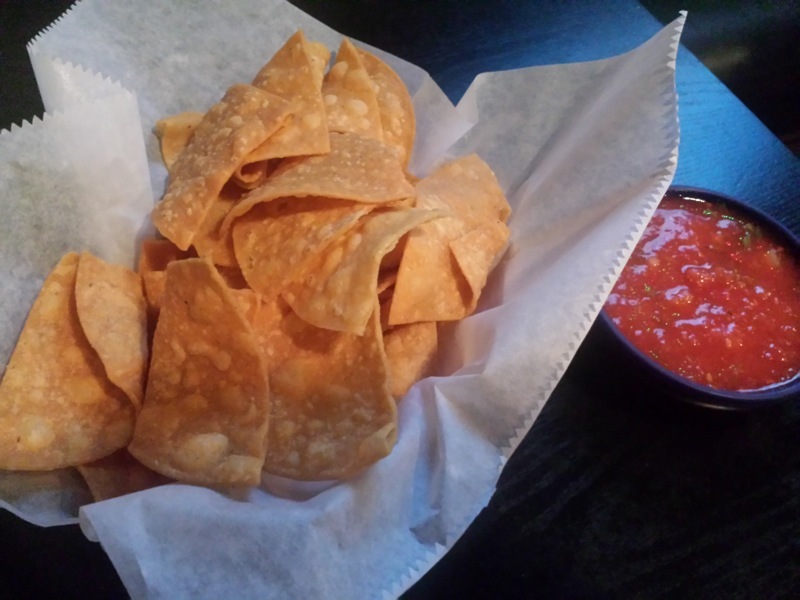 Chips and salsa was served first. The chips were interesting. They were probably double the thickness of a typical tortilla chip. They reminded me more of a pita chip than a tortilla chip. I had their Three Taco Combo. 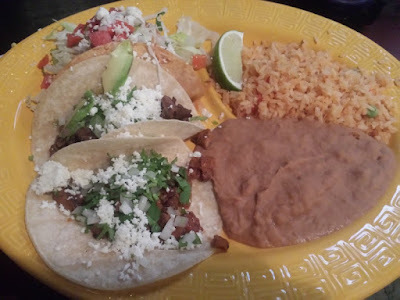 I tried the Carne Asada taco, the Tinga taco, and the Al Pastor taco. The carne asada was filled with steak, onions, cilantro, queso fresco and avocado. The tinga was served on a hard taco shell, filled with chipotle marinated chicken, onions, lettuce, pico, and queso. This was my least favorite of the three tacos. The chicken lacked flavor and toppings combined with the hard shell reminded me of something Taco Bell would serve. My personal favorite of the three tacos was the Al Pastor. This soft tortilla was filled with marinated pork, pineapple, cilantro, onions, and cheese. The sweet pineapple provided a nice balance between the savory pork and the salty cheese. Refried beans and rice were served alongside the tacos. Overall, I liked my tacos. The food was good. My one complaint about Urban Cantina is the TV placement in the restaurant. They had televisions placed around the dining room, like many restaurants do (although I'm not a big fan of this). The problem in this restaurant was that the TV that I was facing behind our table was so low that it was very hard to ignore. Seeing silent images of some sort of crime scene reconstruction show slightly above eye level for my entire meal was really distracting.